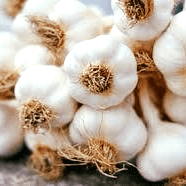 At the 2018 Toronto Garlic Festival, we will be selling: Organic music garlic, Dried garlic chips, and Organic garlic powder. Family grown organic garlic. Small scale – only an acre – so we can give it loving care at Boars Rock Farm.